Everyone knows the importance of brushing and flossing their teeth, and choosing healthy foods. However, regular dental visits are essential for dental health. The Dental Visit And Examinations. Examinations can prevent serious dental problems. When a minor issue is detected, you can have appropriate treatment. Instead of allowing a problem to worsen, your dental health can be restored. You can save time, money, and avoid the pain of long-term dental work. An exam can also detect oral cancer. Prompt treatment can stop cancer from spreading, and may even save your life. The Dental Visit And Professional Cleaning. 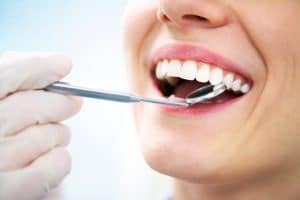 Even when you are conscientious about home oral care and healthy eating, your teeth need to be cleaned at the dentist’s office on a regular basis. Your personal oral care routines do not remove all of the substances that are in your mouth. If they are not removed, they can cause tooth decay, periodontal disease, and bad breath. It can even increase your risk of some medical conditions.Professional cleaning is a simple way to safeguard your oral health and your general health. The time you spend in the dentist’s chair can help you stay healthy. Dental Visits And Education. Most people have questions about their dental health. A routine visit is a perfect time to ask questions and receive answers. Whether you want to know about oral care products, a specific procedure, or basic dental tips, your dentist and his staff are ready to talk to you. Continue eating healthy foods and performing home oral care at least twice each day. Make sure to schedule dental visits on your calendar at least twice each year. Every visit can be a positive experience, and it will greatly reduce your risk of dental problems. You can have clean teeth, fresh breath, and total oral health.